Other products in the "Gloom" series. 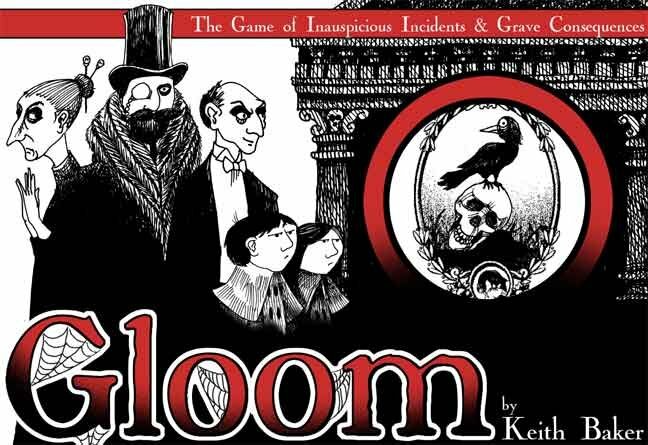 Gloom is a theme-heavy game of misanthropy and doom, and possibly the only card game in which having misfortune and death befall you gains you points. Each family is unique and enjoyable, and though they don't change the game mechanics it's often difficult to choose between the Brain in a Box, Creepy Clown, or Unfaithful Hound. Each card is a morsel of Edward Gorey fan fiction. The game itself is innovative, social, and take-that oriented. Great for any number of players from 2 to 4. 2-4 player game of dark humour and even a darker goal: to make the members of your team/family miserable by card modifiers. Other players can also strive for victory by making their own family members more miserable than yours or make your family members happy, You then lock the numbers in by sending your family to their doom. Dark game, but the theme is unique and the gameplay is awesome! Story-telling is a must! There's also some math for your younger gamers (and the ones in need of a refresher!!) It's gloomy and entertaining. A good lunch game. Gloom is a depressing card game for up to 4 players. The cards are a transparent plastic design which allow for limitless combinations of hilariousness. I recommend it for a mature audience as it does involve killing off characters in horrible ways. The level of player interaction is higher than most games which is a definite plus.